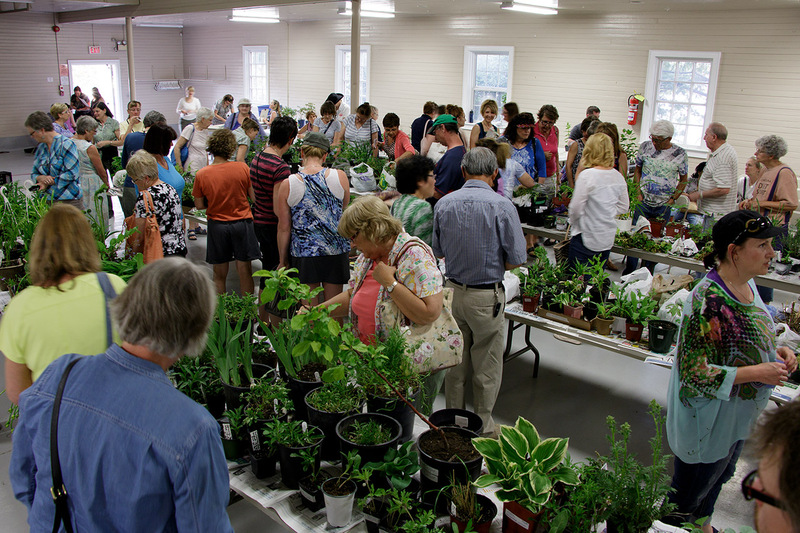 28 groups in 10 communities across Saskatchewan received an EcoFriendly Action Grant in 2015. From starting a seed library to reducing waste from school lunches, each group was committed to making a difference and doing their part in protecting and sustaining the local environment. Look around you. What can you do to make our province a healthier place for all its inhabitants? 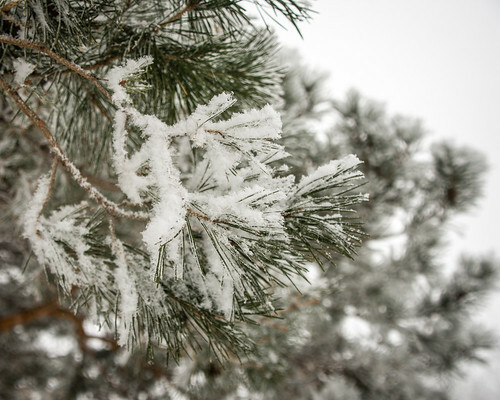 EcoFriendly Sask provides small grants of approximately $500 to support local projects that will benefit the environment. Meet Georgia, the Saskatoon Zoo Society’s North American porcupine, at Wild Birds Unlimited (2600 8th Street East) from 1-2 pm, Jan. 24. Predatory Media: How Sensationalism Impacts Public Perception of Predators in Public Media at 1:30 pm EST, Jan. 28, is the first in a Living with Wildlife webinar series. The webinar will look at media sensationalism about coyotes, wolves, bears, and even some dog breeds, and look at the real world consequences of that coverage. LOVEbirds, Jan. 29 and 30, is an independent stage production using a blend of poetry, puppetry, and costuming. As a bird lover, Ryan Bradshaw has woven birds into every segment of the show. $5 from each ticket will be donated to Living Sky Wildlife Rehabilitation. Pennsylvania finds proof that Passive House standards can be built at affordable housing prices﻿. 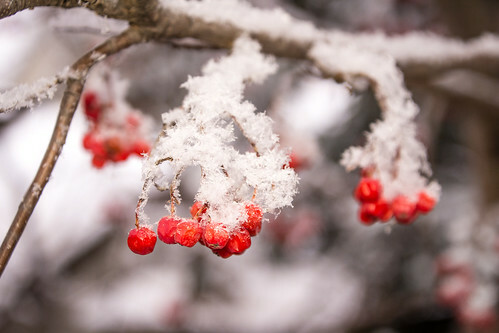 We’ve updated our list of outdoor winter opportunities to include activities from all parts of the province. 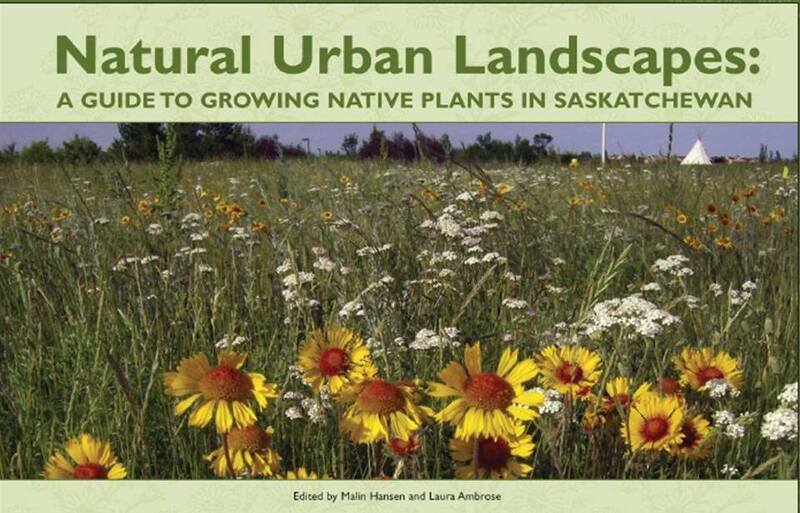 Do you love to hike across the Prairies and wish you could identify more of the plants? Are you a keen birder but would like to expand your knowledge of prairie ecology? Do you love being outdoors, even in the city, and want to help protect our remaining natural areas? Do you like to dig in the dirt or wade in marshes? 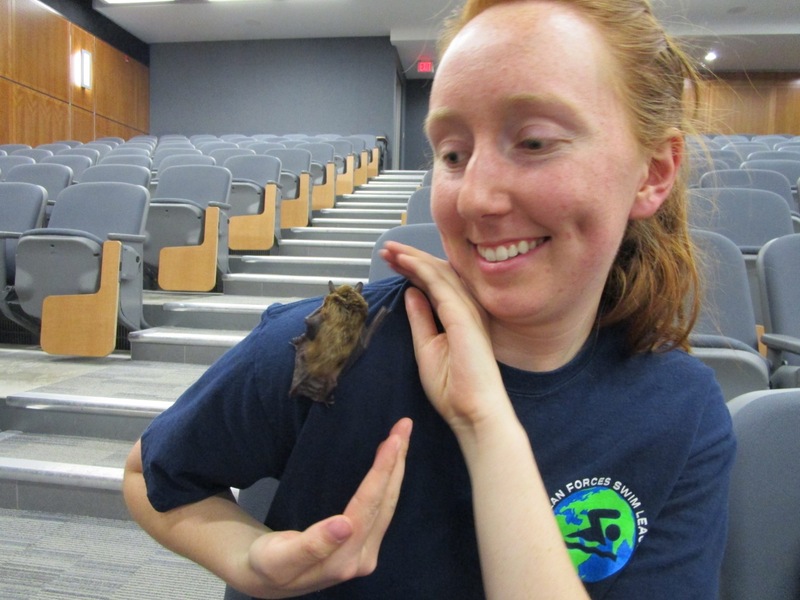 If you answered yes to any of these questions, then you will be interested in joining Saskatchewan’s newly created Master Naturalist program. Chet Neufeld is the Executive Director of the Native Plant Society of Saskatchewan. Chet says that the Society has a dedicated membership and he never has a problem lining up volunteers to remove invasive plants or search for rare wildflowers. However, the volunteers don’t always have the necessary expertise and training can be time-consuming. “Often the event is over by the time people are trained,” he says. Other organizations (Nature Conservancy of Canada, Meewasin Valley Authority, Ducks Unlimited) experience the same problem. The challenge is to provide eager volunteers with the knowledge and tools they need to become stewards of our natural areas. 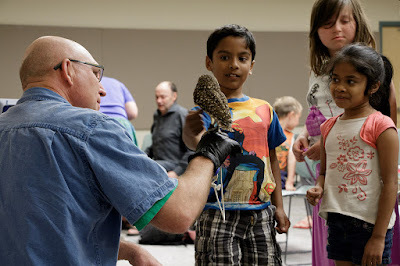 Over half the States and several Canadian cities and provinces have Master Naturalist programs. The Montana Master Naturalist program “is designed for adults who want to stoke their curiosity and deepen their knowledge of the natural world.” The City of Edmonton has recognized that its natural areas “have tremendous ecological, social, educational and economic value” and that it’s important to “work to protect and enhance them, and to educate others, through meaningful volunteer stewardship”. 1. Educational Modules: Interested individuals sign up for the different educational modules, gaining new knowledge and skills through classroom workshops and hands-on outdoor activities. You can sign up for one module that particularly interests you or obtain Master Naturalist status by completing all the modules. 2. 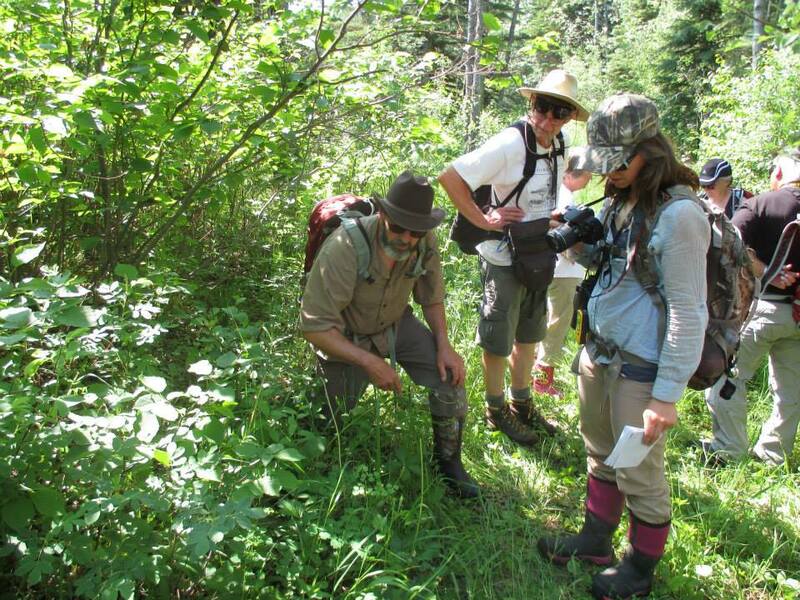 Volunteer Time: Designated Master Naturalists will be expected to contribute a certain number of volunteer hours each year to maintain their designation. It’s also an opportunity for everyone, with course fees being reimbursed after a certain number of documented volunteer hours. 3. Ongoing Training: Master Naturalists will be expected to continue expanding their knowledge through ongoing training. A group of stakeholders has started meeting to discuss the development and delivery of the program. 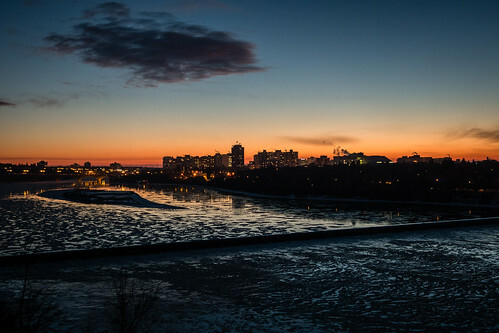 They represent a wide variety of local and provincial organizations, including the City of Saskatoon, Meewasin Valley Authority, Ducks Unlimited Saskatchewan, Saskatoon Nature Society, Saskatchewan Wildlife Federation, and the Nature Conservancy of Canada, Saskatchewan branch. Other organizations have expressed an interest but have not yet made a commitment. Individuals and organizations will take the lead on preparing and presenting the different modules. 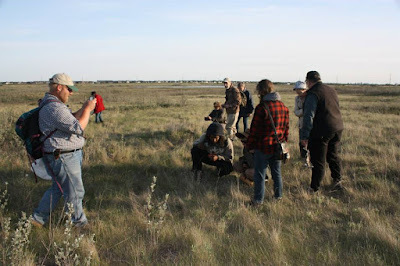 The initial modules are designed to provide individuals with a good base of general knowledge and are expected to include: archaeology and Aboriginal traditional knowledge, ecological engagement, citizen science (how to collect and submit data), prairie ecology, forest ecology, aquatic ecology, and urban ecology. The first three modules are expected to be developed by the end of March 2016. Chet says that the fee for participating in each module will be kept low at $25-50 per module. If you take the course and then contribute a certain number of volunteer hours, your money will be refunded. Participants could end up taking the entire course for free. 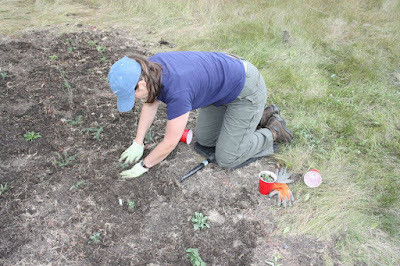 Volunteer opportunities will range from monitoring wildlife activity in the Northeast Swale to pulling down fences on Nature Conservancy of Canada properties or rooting out invasive plants. The School of Environment and Sustainability is hosting a panel on Challenges and Opportunities in Renewable Energy in Saskatchewan at 1:30 pm, Jan. 15. Panelists include Mark Bigland-Pritchard, Ian Loughran, and Kevin Hudson. Nature Regina is hosting a photo presentation on the Galapagos at 7:30 pm, Jan. 18. Heather Facette will discuss Grassland National Park’s efforts to reduce fence-related wildlife collisions at 12 pm, Jan. 18, in a Native Prairie Speaker Series webinar. The U of S Environmental Studies Students Association is hosting a networking and summer job search presentation by the U of S Employment & Career Centre from 4:30-7 pm, Jan. 20. Sarah Wood will discuss her research on the effects of neonics on the grooming and hygienic behaviour of bees and on the development of their larvae at the Saskatoon Nature Society’s meeting at 7:30 pm, Jan. 21. 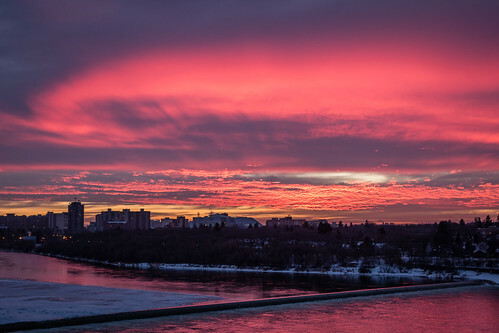 Friends of Wascana Marsh are holding their AGM at 7 pm, Jan. 21, at Wascana Place. Car Free YXE is a new Facebook page documenting individuals living car-free in Saskatoon to better understand their motivations, needs and desires. 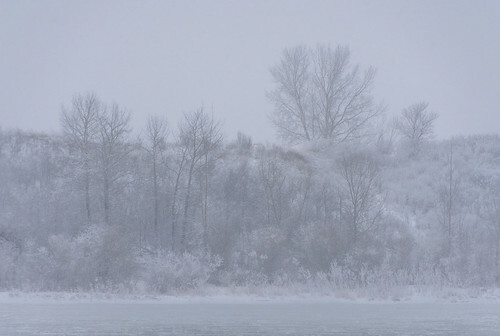 A group of Elbow business owners, residents, and vacationers hope to build a trail along the shore of Diefenbaker Lake. Like and share their Facebook page to spread the word. Murray Guy of EcoSmart was the first presenter for a Net-Zero Energy Building speaker series in Kimberley and Cranbrook. EcoSmart recently completed a duplex in Saskatoon with one side targeting net zero and the other 60% less energy use than typical construction. A Kimberley, BC, program refunds up to 80% of the building permit for energy efficiency. The Melfort Cross-Country Ski Club maintains the Gronlid Trails in Fort à la Corne Provincial Forest. 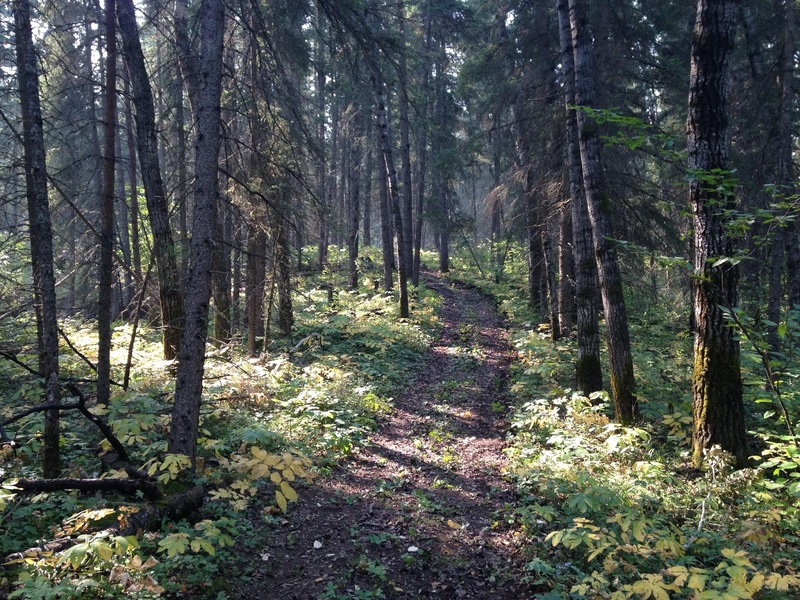 There are 20 kilometers of beginner and intermediate trails with warm-up shelters, washrooms, and parking. The trails were badly damaged by ATVs in 2015, and the Club requested an EcoFriendly Action Grant to help them repair the trails. The Club received permission from the government to reseed and mulch the trails, using the grant money to purchase the mulch. They posted No ATV signs at entrances to the trails and were pleased with the response. Less ATV traffic helped the grass to get started in the sandier areas. In addition, the Melfort Cross-Country Ski Club, in conjunction with the Tisdale Running Club, held a run on August 30 to raise awareness of the trails and draw attention to the problems caused by quads. 120 racers made the Wapiti Bush Run the second largest bush run in Saskatchewan. In the past, the Club has had to wait for a significant amount of snow to fall before they could set track on the trails as they needed at least a foot of snow to simply fill the ruts left by the ATVs. This year, they were able to set track with only 10 inches of snow. ATVs can cause significant environmental damage and this is a problem in many areas of Saskatchewan. Trevor Herriot provides additional information in More on prairie trails: unregulated ATVs and unmanaged access. Dr. Carey Simonson, Professor of Mechanical Engineering, U of S, will discuss energy exchangers for HVAC systems and district heating at the 7 am, Jan. 6, meeting of the Saskatchewan Energy Management Task Force. Permaculture Saskatchewan is teaming up with Green Drinks Saskatoon for a social get-together at 5 pm, Jan. 8, at Bon Temps Café. Vereco Homes is hosting an open house and a workshop explaining energy and water savings of a Vereco home on Jan. 9. The Northeast Swale Watchers will be meeting from 3:30-5 pm, Jan. 13, to discuss the long-term protection of the Northeast Swale. Peter Prebble will look at what the 2015 Climate Change Conference means for Saskatchewan at 7 pm, Jan. 19, at the Frances Morrison Library as part of the Sustainable Speaker Series. 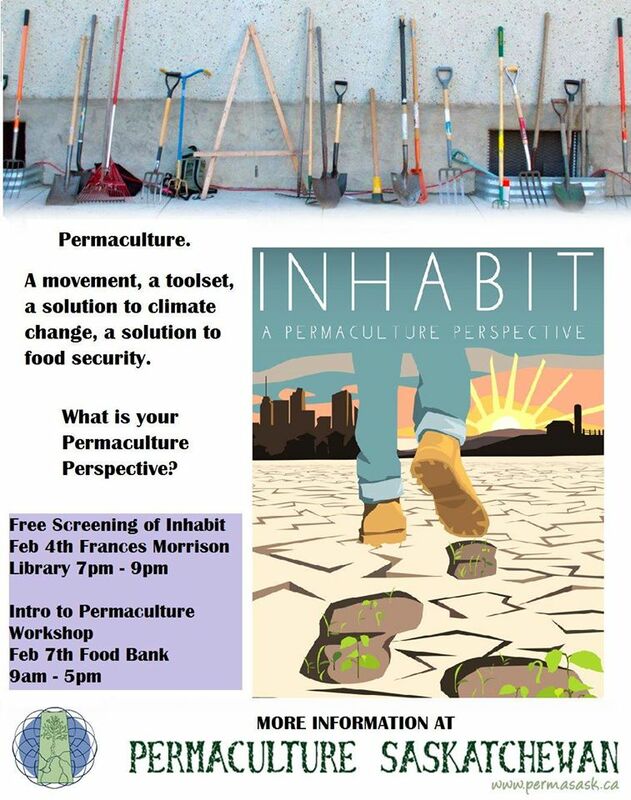 PermaSask is hosting a one-day Introduction to Permaculture Workshop from 9 am - 5 pm, Feb. 7. Participants will have an opportunity to do some design on their own yard or help someone else with their design. Planning is already underway for Jane’s Walk Saskatoon, May 6, 7, and 8. Anyone who wants to lead a walk or find out more about Jane’s Walk is encouraged to contact Cathy at 306 664-3908. Share your knowledge of what can be recycled and where by joining the Let’s Roll Recycling Team. The team has a mobile van and promotes existing recycling and waste management programs through fun, games, and education. Environmental and social campaigners are getting creative by using illustration, craft and dance to put sustained pressure on business and governments﻿. Passive house principles are being applied to schools in England and Wales. There’s even a zero carbon school in Exeter.